6 negatives : b&w; ; 120 mm. Prime Minister Eisaku Sato of Japan arrives at the Los Angeles International Airport (LAX) and attends a luncheon hosted by the Los Angeles World Affairs Council and the Japan America Society at the Biltmore Hotel in Los Angeles, California, January 15, 1965. Includes Los Angeles Mayor Sam Yorty and Consul General of Japan to Los Angeles Toshiro Shimanouchi. 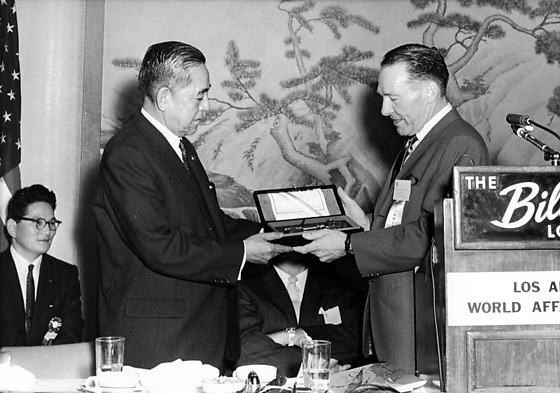 1P and 5N: Mayor Yorty presents the key to the City of Los Angeles, a large key in a box, to Prime Minister Sato. Podium with microphone, "The Biltmore Los Angeles, Los Angeles World Affairs Council", at right. 2N: Consul General Shimanouchi speaks at a panel including the Ambassador, left, Prime Minister Sato, right, and Mr. Miki, far right. The men wear suits and sit behind a long table with tablecloth, name plates and microphones. Bright light shines background right. 3N: Prime Minister Sato leans forward to shake hands with a little girl in a kimono on the tarmac at the airport. Sato holds a bouquet of roses in his proper left hand. 4N: Mayor Yorty and Prime Minister Sato at airport. Sato stands smiling at right holding a bouquet of roses. A policeman stands behind Yorty at left. 6N: Ambassador, Mayor Yorty and Prime Minister Sato sit at head table near podium. 7N: An African American man in eyeglasses and suit presents a certificate to Prime Minister Sato as Mayor Yorty applauds at left. Podium at right; American flag in background left. 8N: Prime Minister Sato shakes hands with Mayor Yorty at the Biltmore among a group of men standing in a row. Typed on original envelope: Prime Minister Sato -- Airport and Biltmore Hotel.